Maybe if someone drilled and tapped a bullet, from the nose toward the base, it could be used to do bullet pull experiments by screwing in a small screw eye after seating. I would think that one of the new all gilding metal Hornadys would be ideal, giving better mechanical properties, for this application,than a lead core. they do make tools that measure the amount of force required to seat the bullet… from there, we could just trust good ole Newton. One thing that was missing was whether your brass was made for that cartridge (lets say “260 Remington”) and you used “243 Win” or “7mm-08″ brass. In my (limited) experience the 243 brass maintains a tight grip (more spring-back) for several firings. While there are tools for comparing seating force(I use one), seating force and bullet grip(tension) are two completely different things. Both are important, but not for the same reasons. Seating force affects resultant OgvOAL on seating. There is currently no tool available to measure tension. First – thanks for publishing discussions such as this. This helps us all to improve and become more aware. 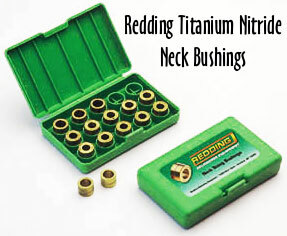 The later statement “When a guy says, ‘I run .002 neck tension’, it’s safe to assume he is using a die/bushing that sizes the necks .002″ smaller than a loaded round.” is a much better description. Editor: Josh … I think I understood your point. For clarity, I modified the first paragraph to explain that the .001, .002, .003 numbers folks toss around normally refer to the difference between a sized neck OD and the OD with the bullet in place. These are what people mean Josh, but none of it’s actually true. A sized neck OD .002 under loaded OD amounts to the INTERFERENCE FIT, and does not directly mean anything about tension. Over-anneal a neck & size it down(only), you’ll find that it is left at a smaller OD(because it springs back less from sizing). This will also cause an increase in seating force, but tension itself is lower with that annealed neck. You can probably pull the bullet with your fingers.. 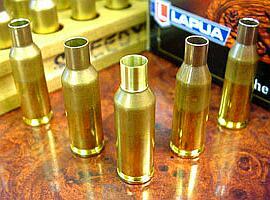 I try to prepare my brass (Lapua) as meticulously as possible, but I measure my neck tension in a very expensive way. 3) Ream inside of neck with Forster reamer. 5) Trim outside neck (sorry, I don’t remember my exact wall thickness measurement off the top of my head). Minimal trim and consistent. Now comes the expensive part. 50 rounds is enough for about anything I shoot, so I meticulously prepare 100 rounds and put them in a 100 round bullet case. I then shoot them at nothing through my chronograph, recording the MV of each. I then go home and put all the MVs in an Excel spreadsheet and set aside cells to record mean, median, mode, max, min, ES and SD. I pull cases from the max and min alternately and recalculate until my ES is <= 20 (usually resulting in an SD of <= 6). I declare all the rest of the cases usable. You'll probably cringe at this, but I then go ahead and anneal those usable cases and run them through my Thumler Tumbler. I neck size and reload. Doesn't seem to matter, they almost invariably result in an ES of 20 or less on the next firing. It hurts me to fire a round without purpose and put 100 rounds through my barrel… but what works (for me) works and so far I'm willing to pay the price for the vertical consistency. If someone could only teach me to read the winds on Range 4 at Quantico from the 1,000 yd line, I'd be the champ. Good article. I was surprised that the Lee Collet Die wasn’t mentioned in this process as an alternative to bushing dies because of the recent praise of this die on a post on this site by quite a few people.